Toptube wrote: The general trend in the multiscale market, be it guitar or bass, is an angled aesthetic, to at least loosely follow the fan of the frets. Most of the potential customer market, is expecting to see such. You keep making this claim. Please show us some data to back it up. Personally, I believe that the multi-scale market is such a niche of isolated players that there is no general consensus for what it generally wants. Granted, my evidence is only all the YouTube videos of lonely dudes in their mothers' basements plugged into their laptops playing tappity-tap-tap heavy metal Muzak on their multi-scale monstrosities. Not all of his multi scales have the pups oriented like that. They've really been gaining popularity with his production lines. There are some models where the neck pickup is aligned with the 24th fret, and the bridge pickup is aligned with the bridge saddles...but those look wonky to me...which shouldn't matter, I know...but they look very messy. The Vader doesn't look as "off" as the Aries because the bridge's baseplate on the Vader follows the 24th fret, even if the saddles don't. Sounds like he just wasn't feelin' it as much as the Vanquish. While it's still new, sales haven't been explosive. Good, but not great. As it stands, the Vanquish will need to prove that there's a market for a Kiesel multiscale before any additional models are developed. OTHER than the Vader multiscale basses. I'm almost positive THAT is going to happen. any P4 shape pickup with dual or quad coil blades, should work fine to tilt for a 6 string multi scale. Bartolini, Aguilar DCB, Nordstrand dual coil neo. However, none of those are radiused. Someone on Talkbass replaced the radium dual coils in his LB76, because he didn't like the tone. Replaced them with Aguilars. He likes the tone a lot better, but volume is not consistent, from string to string. Nordstrand does have the new Big Blades pickups, which are a radiused blade. Those would probably be great in P4 size, for a multi-scale. Toptube wrote: Nordstrand does have the new Big Blades pickups, which are a radiused blade. Those would probably be great in P4 size, for a multi-scale. Either way, this may be the ticket to getting the multi-scale 6. The real question is does Jeff really have the Vanquish multi-scale bass programmed on the CNC machine still despite the model not being official and will he be willing to still do it if we send him the correct-sized pickups? I'm surprisingly willing to sacrifice my 'this-is-totally-not-a-metal-looking-bass' love/meh attitude for the Vanquish shape if they are willing to do this. I seriously doubt the nordstrand screw pattern would be an issue. I have seen them do a lot more than that, for customers, to get pickups installed into a Kiesel. In regards to getting a 6 string multi-scale vanquish built---------Jeff said its ready. However, he did not say what size pickups it is setup for. I was talking about P4, simply because it would make sense. 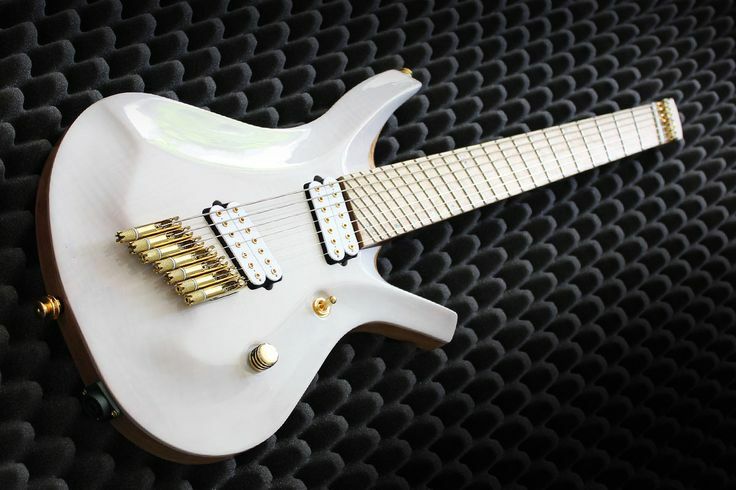 But, I have no idea what Kiesel is thinking, in regards to pickup size for their 6 string multiscale. Just watched Jeff's Facebook Live Booth tour and didn't see a 4-string multi scale. Gonna save my pennies for the 4 string. amon wrote: . . . all the YouTube videos of lonely dudes in their mothers' basements plugged into their laptops playing tappity-tap-tap heavy metal Muzak on their multi-scale monstrosities. Nothing of substance to contribute to a very interesting thread other than to say that the above is some epic prose. He was saying he liked what you said. I have to admit, until I got to the end of the sentence, I thought he was commenting on the *worth* of your comment, but that's not what it was. Last edited by spudmunkey on Sat Jan 21, 2017 12:30 pm, edited 1 time in total. amon wrote: Selective editing is fun! I'm sorry, man. I was offering a compliment by saying that I didn't have anything cool to add to the conversation, but that I really liked the image you evoked. My misunderstanding, I apologize. And to prevent the possibility of any more episodes of Three's Company, I'll just leave it at that! I wholeheartedly agree! I'm guessing they're waiting for a customer to order a VM49K to be built to their photogenic standards before updating the picture on the website. Here's to hoping they use mine! Although it probably won't be done until late March or early April. I was kind of shocked not to see a 4 string multiscale Vanquish in any of the NAMM pics. I saw at least 3 of these being built in the custom shop, during today's live FB video. Jeff has a Mclaren Yellow 4 string Multiscale Vanquish being built. Its got a music man style humbucker at the bridge and a Jazz bass style single coil at the neck. Its mostly done. Looks pretty cool! No pics in the wild yet?